Hear ye, hear ye, read all about this expertly crafted newspaper gown by Yuliya Kyrpo, now on display at London’s Science Museum. Krypo assembled her headlining bustier dress—complete with a flowing peacock train—from 1,000 paper cranes, which she painstakingly hand-folded from old Metro newspapers. We can definitely see sweetheart-neckline-adoring songstress Katy Perry rocking this frock on the red carpet. I love this dress! Can it be worn, you suppose? 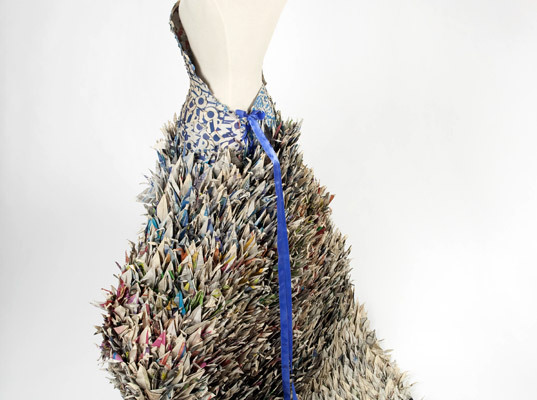 Hear ye, hear ye, read all about this expertly crafted newspaper gown by Yuliya Kyrpo, now on display at London's Science Museum. Krypo assembled her headlining bustier dress�complete with a flowing peacock train�from 1,000 paper cranes, which she painstakingly hand-folded from old Metro newspapers. We can definitely see sweetheart-neckline-adoring songstress Katy Perry rocking this frock on the red carpet.